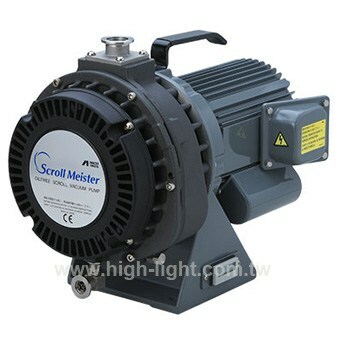 The Scroll Vacuum Pump is the right combination of small size, high performance and low cost. A compact, reliable vacuum pump designed for use on clean processes. Not suitable for use with explosives, flammable,toxic, corrosive substances or particles that contain powders. To pump condensable vapors orto pump down from atmospheric pressure in a humid environment (for example, if relative humidity exceeds 60%), you must use the gas ballast that comes with the pump. This pumps is air cooled with an hour counter. Light, oil free and little routine maintenance.